Can I Delete Old Updates? - Ask Leo! It all really boils down to how updates are applied. Some you can delete, others you should not. I'll review the different types. As time goes by, I get updates on different programs, which are stored on my computer and taking up space. Can I delete earlier versions as new ones are updated? The answer to your question really depends on exactly which updates you’re talking about – as well as exactly how they’re delivered and installed. Let’s start with Windows itself. The answer here is generally no. 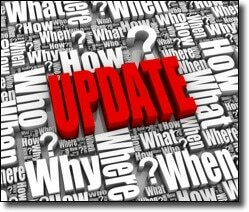 Updates often build upon previous updates, so removing a prior update can sometimes cause problems. But there’s a a caveat: a cleanup utility – sometimes called Windows Update Cleanup – may have the option to remove prior updates. Two things though: If you’re going to do this make sure to use Windows disk cleanup; it will keep track of those dependencies that I mentioned, where a new update relies on an older update. And if you do this, keep in mind that you will be losing the ability to uninstall any updates that remain. Currently, you can uninstall an update, which basically means that Windows replaces the current updated files with the old ones from the previous version. If you remove those previous versions with a cleanup, then it just can’t put them back to perform the uninstall. This same scenario is also generally true for Microsoft Office: updates are applied to the program directly. Files are either removed for you at that time or if they’re not, they’re probably needed to keep things working. Other programs, however, often update themselves quite differently. Rather than just updating parts of the program or patching the program, they simply have you download a completely new version and install it. When this technique is used, you can typically delete the previously downloaded installer. Note that you’re not deleting the installed program that’s been updated by the new download. What you can delete is the old download from the original installation, or from the previous update, and this applies only when the program updates itself by downloading an entirely new copy. And for the record, I do recommend that you save at least the most recent download installers, especially for programs that you may have purchased. Should you ever need to reinstall from scratch, you’ll have them ready to go. Now, if it’s not clear that a program updates in this manner – a complete download and replacement – then honestly, I’d do nothing. I’d leave well enough alone. Chances are the program is either cleaning up after itself, or the parts that remain are required for some reason. « Previous post: Is Moore’s Law over? I used to delete the older installation files of freeware programs like Firefox, Chrome, Thunderbird etc, and keep the latest version. I eventually came to the conclusion that there was no reason to keep the latest version as 1. the latest version is always available free on the Internet; 2. If I ever need to reinstall the program, my latest version might not be the latest version available. I used to have the same thinking as you until the day came when I had to reinstall something, but I needed internet access and couldn’t get it (I can’t remember if it was a driver issue or ISP issue or what). Without being able to obtain it from either my external harddrive or from the internet, I could not do what I needed to. At least if I had kept a copy on my external I could have installed that. It might not have been the latest version, but at least I could have kept working until I could download an updated version. So now with all that said, I’ve decided my laptop is working just great with all the current updates ,, on a fresh install of XP PRO (2008). My question would be; Is it now safe to “delete all” of the HotFix Uninstallers ?? or, can they be moved ?? My goal being to keep the OS space on the hard drive as clean as possible !! Back ’em up first, and then sure … delete away. That was helpful. Thanks !I would like to learn more about my computer. hi. i have no IT knowledge . can i delete older versions of any updated program eg. I have a little Asics netbook (runs Windows 7) that I seldom use (only for occasional travel), and it has hundreds of Windows updates listed on it from as far back as 2011. Can I safely uninstall a bunch of those, assuming that that will give me more storage space on my computer? Thanks! Nope. If they’re installed they’re installed for a reason. I turned off the windows update because it took hours of waiting. Then when installation ended, the message was “update installation failed”. Then it took a lot more time. Any suggestions? i am in a quandary, and i don’t believe in coincidences. i just noticed yesterday that on the SAME DAY (july 11) windows update KB4338819 was installed on my machine, windows miracast to the miracast HDMI dongle i had installed on my HDTV stopped connecting. all the manufacturer (not microsoft) would say is “windows 10 isn’t stable for miracast.” so i bought a microsoft wireless display adapter thinking microsoft-to-microsoft – this will work. but it didn’t. the interesting fact is that the app i use to cast from my samsung tablet connects to BOTH dongles every time, and displays full HDMI on the tv screen. you say it’s generally not advisable to uninstall previous updates, but what else is my option? Generally, no. But back up first anyway. It shouldn’t, unless the process of uninstalling and reinstalling the updates somehow damages your data which has been known to happen. That’s why it’s always best to backup before any major upgrade or installation. Question, not comment. How much (approx.) space in my hard-drive would be taken up by 6 years of Windows updates (the unsolicited kind)? I have very little space left and I would rather not get the Geek Squad to fix it if there is something I can do at home. Tried Google but I don’t have any of the folders or files I was instructed to open. Yes, I am a techno-moron, so please use small words:) Can anyone HELP?!!! There’s simply no way to know — it varies depending on your version of Windows, the edition of Windows, the computer you have, the options installed and so on.